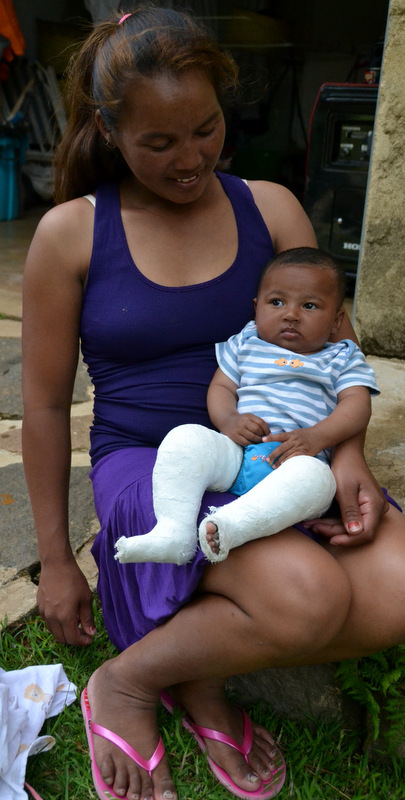 Onja, the mom of baby Evah with the clubfoot, came by today to give an update on the operation and how they’re all doing. Evah was, i was so glad to see, happy and cooing like any contented 3-month-old. Sigh. It does my heart good to see that! I’ve been praying so much that she wouldnt be crying and fussing because of the pain post-op. Onja took Evah for the operation last Tuesday. Afterwards the baby was put into casts that reach from toe to hip to maintain the shape of the leg. The money that i (that is, Distaff) gave for them for the operation has paid for all the costs of the medical procedures, including all future casts. Every 2 weeks, as i understand, the casts will be changed and the legs/feet reevaluated. She has two more changes coming up. I understand that the last set of casts will be plastic or leather, which i’m hoping means that they will be removable to allow for washing, etc. Onja was impressed by the information that the doctor showed her of what people with clubfoot will look like without the operation – legs bowed so incredibly, feet turned under, making walking difficult. The mom could only point out, ‘What man would want to marry my daughter if she looked like that’. Shame. But it’s true that the operation done now in infancy will have such an incredible impact on Evah’s life. I think Onja just realized the immensity of that change last week. While the operation went well and Evah seems to be doing nicely there continue to be challenges, most due to their financial situation. Evah isnt getting enough milk from her mom and therefore is cranky because she’s hungry, so says Onja. Onja therefore gives Evah cookies to fill her up. A 3-month old. Gah! So i gave some money to buy formula today to use instead of cookies and was very firm on the fact that cookies to 3-month-olds is not a great idea. Especially for a baby having operations done to her legs, shifting the bones in her body. Let’s just go ahead and help her get as much nutrients for her growing bones as we can, shall we. Formula will now go back onto my shopping list and Onja can pick up a can whenever she comes by. The operation went well with the one exception that Ndrasena, Onja’s husband and Evah’s dad, was not given leave from work to go along. This would be stressful for me as well, but apparently it’s necessary for the family to bring help along to hold the baby still while the doctor washes the legs and feet and puts on the casts. Onja went to the operation herself last week and was severely reprimanded by the doctor for this, since then they had to get nurses to help. Apparently it takes at least 4 people to assist with this. They have no family nearby and the neighbours are not willing to come with to sit in the hospital all morning waiting for the operation to happen. They need this many people to help with the changing of the casts again tomorrow. Onja went directly from my house this afternoon to the employer of her husband to plead her case for him to be allowed to come this time. We asked God for favour in this regard, i only hope that He will change the heart of the employer to allow this so that at least Ndrasena can go along. Last week when Evah had the operation she was sick for 2 days. Please pray with me that she will do well tomorrow and for the week following. Ndrasena continues to look for a new job closer to home (Ivandry) that will pay him a living-wage (ie. one that allows him to pay for rent, food, schooling for his kids). Please pray with me that a family in Ivandry would be looking for a full-time gardener. A family who is kind and pays a fair wage. Because of their financial situation Sarah, the next oldest daughter who has the speech-challenges, has not been put into school despite the counsel of the Occupational Therapist. While she appears to be doing really well, improving with her speech capacity in leaps and bounds, it would be beneficial for her to attend the same school as her two older sisters already this year – now. The problem is, they simply cannot afford it. While they’ve looked around for a cheaper school alternative, Onja explained that because she’s the sole parent able to bring her children to school, it’s not possible for her to bring her daughters to two separate locations. The school where the two older daughters (Miora and Felana) attend costs 13,000Ariary per child per month. (13,000Ar is about 7$). It’s laughable to us how cheap that is, but for someone scraping by just to feed everyone and pay the rent, it’s enough to prevent the 3rd daughter from going. We prayed today that Sarah (age 4) could begin school at this school – the same as her in January. God will have to find a way for this to happen. For His Glory. Please join us in praying that this can happen. Ideally, it would be the best situation if Ndrasena could find a job that could pay for this himself. While it’s easy for us to give the money to pay for the resolution of all these problems, it’s not a sustainable solution, and besides that, I do believe that it’s better for the family themselves that they become able to take care of their family with their own resources. Thanks for your prayers on their behalf. More updates to come.